There are many things one can do to stop the laziness from setting in including exercising, organizing and doing things one step at a time. We’ve all been there – feeling too tired to do anything, taking multiple naps in a day, dreading doing something and constantly putting it off. We’ve also all downloaded productivity apps and read up on how to be more productive, but alas to no success. 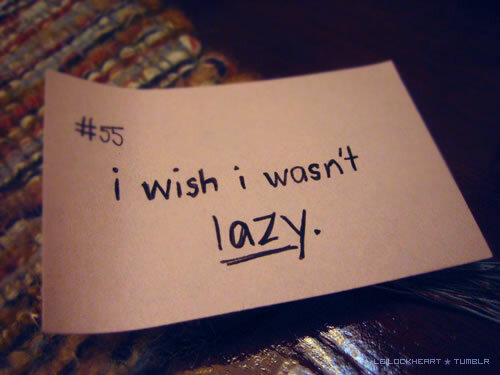 There are a few reasons for laziness to set in. The first one is being overworked – which means you’ve been working too hard and this is your time to relax and put your feet up. Enjoy it. Second one is there is lack of motivation which is putting you off doing any work. This article talks about this type of laziness. In order to deal with this laziness, first ensure which category you fall under. Once you have identified your problem, only then can you look to solve it. Break things down: Sometimes people start putting off work or feel constantly tired because they have taken too much on their plate. If you take too much on, the anticipation of all that work waiting for you is enough to tire anyone out. Break down your vast list of things and mark them according to importance. Do the things that are most important and put off things that are not so important. Simplifying tasks and taking on task one by one can often help put off that dread and get you more motivated for the tasks ahead. Exercise: The benefits of exercise is numerous and you will find it on almost all our list of living a healthy life. Morning exercises are even better as it will give you a rush of adrenalin that will keep you going all day long. Even if not, try just jumping jacks to get your blood pumping. Any form of movement in the morning can shake off that laziness and get your pumped for the whole day ahead. So, go ahead and skip that snooze button. Sleep: Sleep is also an important aspect to living a healthy life. If you do not sleep, you do not wake up with enough energy and while it might be okay for one day, it is just going to keep you crabby for the rest of the week. Sleep can help you build energy and keep you rejuvenated for the rest of the day. Organize: Many times a lot of people are lazy because they live cluttered lives and don’t know where they should start. Organize, clean up that desk or that closet. Organizing is known to keep help unclutter people’s minds and help them beat laziness. Motivation: While this one is not as easy to understand, this point just means that sometimes all you need to stop being laze is a little motivation. This can be found in the small things – setting goals, or visualizing the output, or by even giving yourself small pep talks. You won’t realize how a little motivation can go a long way. Benefits: The best way to get over laziness is to imagine the benefits of working or doing whatever you have been putting off. This can also be as small as organizing your closet – no more wasting extra time trying to look through heaps of clothes to find what you want to wear for the day. That saves a lot of time and energy. Looking at the benefits instead of the task on hand can help motivate you and get you off that couch. Missing out: Now do the opposite – instead of thinking of the benefits that can arise from not being lazy, think about all the things that you might be missing out on if you be lazy. Think about all the things that you could have achieved and gained from not being lazy. This works for a lot of people who don’t think about the benefits but instead focus on the consequences. Visualization: Visualize what you want to do and how you want to go about doing it. Often than not, visualizing it makes it easier and makes you realize that the task is probably not as big as you are making it out to be. This gives you a method or a plan in your head and lets you know how you can go about doing the task. Be Your Own Coach: Don’t wait for someone else to motivate you, instead motivate yourself. Tell yourself positive things – this can also be as small as congratulating yourself on getting off the sofa or telling yourself that you look good today. Believe in yourself and sometimes that is all the motivation your need. Avoid Procrastination: Avoid procrastination at all costs. Don’t try to put the work off tomorrow, instead do it today and tomorrow look to accomplish something bigger. If you start procrastinating, it will continue and it becomes more difficult to break the cycle. Start: Actually get up and start getting work done. Get up and do something, even if it means something as small as putting things away or washing the dishes. The objective here is to start something and once you start don’t stop. Don’t take breaks until you really need it and even then time it and stick by it. Reward Yourself: Reward yourself on accomplishing small goals and then even bigger goals. The more you set yourself with rewards, the better you will accomplish goals. Looking forward to the reward can help accomplish some even bigger goals. So, go ahead and be proud and enjoy that treat on doing a job well done. Shake Things Up: Sometimes lack of motivation comes from a monotonous routine and how boring it gets. In times like these, it is better to shake things up and change the routine. Do something unexpected and different. It might help give you that motivation you need. Here are few things that you can do to accomplish overcoming laziness or to keep yourself from getting lazy. Once you break the cycle of laziness, everything else just gets easier. All you need now is to take the first step!